Results of the catalytic hydrogenation of lignin in a hydrogen-donor solvent medium are described. Nickel-containing systems are deposited directly on the lignin surface in an amount of 1.5–3.4 wt %. Nickel systems are deposited by two methods: from a Ni(OAc)2 × 4Н2О aqueous solution and from a colloidal solution in toluene of nickel particles prepared by metal vapor synthesis (MVS). The hydrogen donor solvent is tetralin taken in a tetralin/lignin ratio of 1 : 1. Hydrogenation was carried out in a rotating autoclave at a temperature of 400°C and a pressure of 100 atm. 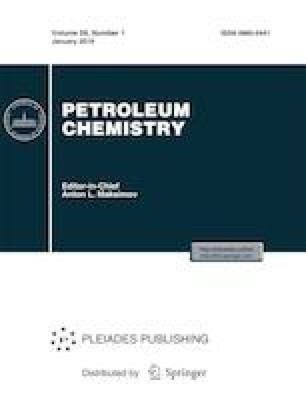 It is shown that the preactivation of nickel-containing lignin by ultrasonication at 39 kHz for 20 min leads to an almost exhaustive conversion of the organic matter: the hydrogenation products comprise 13.1 wt % gas and 86.3 wt % liquid hydrocarbons. The liquid hydrogenation products contain aromatic hydrocarbons and nonvolatile condensed compounds with an average molecular weight of 300 Da. The effect of sonication on nickel-containing lignin and the evolution of nickel-containing components during lignin hydrodepolymerization are studied by electron microscopy and magnetic susceptibility methods. The authors thank S.A. Nikolaev for discussing the TEM results. This work was performed under the state task to Topchiev Institute of Petrochemical Synthesis, Russian Academy of Sciences. Magnetic measurements were carried out under the state task using the equipment of the Center for collective use at the Kurnakov Institute of General and Inorganic Chemistry, Russian Academy of Sciences.